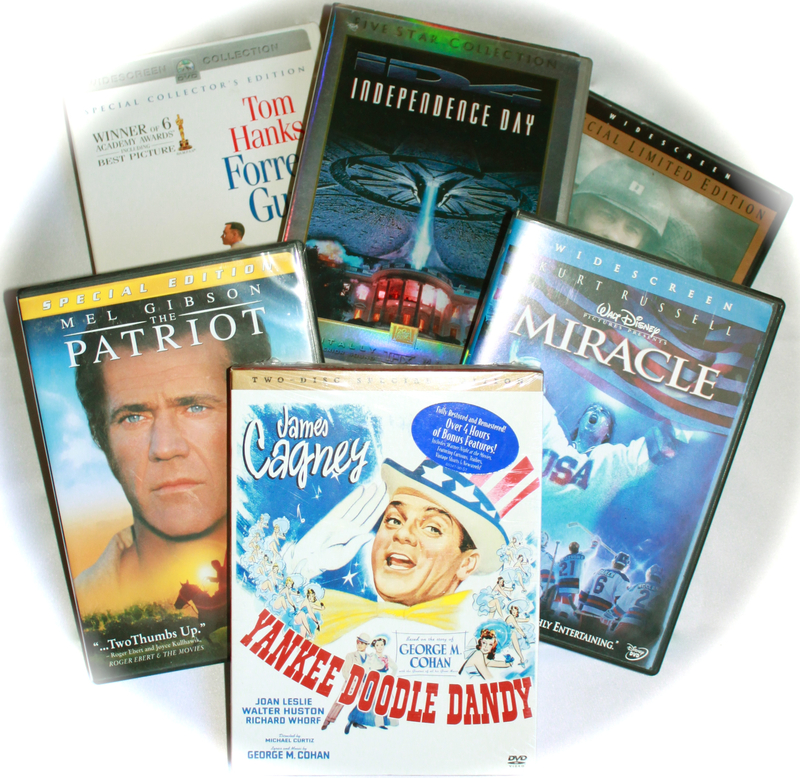 If you’re looking for a movie to watch this Independence Day, there are plenty of great titles available on home video. No major theatrical releases are making their way to video this week, so it seems like the perfect time to suggest some movies that are sure to put an exclamation point on your July 4 holiday. All of the following are readily available on home video. “Yankee Doodle Dandy” (1942): This charming film tells the life story of real-life entertainer George M. Cohan (James Cagney). That may not sound patriotic, but the movie smacks of the red, white and blue because Cohan wrote a number of America’s most-beloved patriotic tunes. His songs “Yankee Doodle Boy,” “Over There” and “You’re a Grand Old Flag” are all featured in the movie, and James Cagney is outstanding in the lead role. “The Patriot” (2000): This Revolutionary War saga isn’t perfect, but it’s a nice choice for Independence Day. The film is set in 1776, and it tells of Benjamin Martin (Mel Gibson), a veteran soldier who has settled into a peaceful life as a farmer. Alas, when a cruel British officer (Jason Isaacs) kills his youngest son, he decides to fight again. Directed by Roland Emmerich (“2012,” “The Day After Tomorrow”), “The Patriot” is a big, loud blockbuster, but the cast – including Heath Ledger and Chris Cooper – keep things earthy and enjoyable. “Independence Day” (1996): This Roland Emmerich film is even bigger and louder than “The Patriot,” but it wouldn’t make sense to exclude it from our list. After all, it was named after our July 4 holiday. The plot centers on a widespread alien invasion and the Earthlings who fight back. Will Smith, Bill Pullman, Jeff Goldblum, Judd Hirsch and Mary McDonnell star. “Apollo 13” (1995): The space program is a key part of American history, and no movie salutes the bravery and ingenuity of U.S. astronauts as well as “Apollo 13.” Based on actual events, the film details the days leading up to the Apollo 13 mission, the explosion of an oxygen tank after launch, and the crew’s desperate attempt to return home. Tom Hanks, Bill Paxton, Kevin Bacon, Gary Sinise and Ed Harris star. Directed by Ron Howard. “Miracle” (2004): America is a nation of sports lovers, and few achievements have made the country as proud as the U.S. men’s hockey team winning the gold medal at the 1980 Winter Olympics. This movie, directed by Gavin O’Conner (“Warrior”), considers the team’s unbelievable run. Look for Kurt Russell’s outstanding performance as U.S. coach Herb Brooks. Patricia Clarkson and Noah Emmerich also star. “Saving Private Ryan” (1998): The combat sequences director Steven Spielberg assembled for this film are among the most graphic and horrifying set to screen. Because of that, they are also a wonderful reminder of the sacrifices our World War II combat vets made. Tom Hanks, Tom Sizemore, Edward Burns, Barry Pepper, Vin Diesel, Matt Damon, Ted Danson and Giovanni Ribisi star. “Forrest Gump” (1994): “Forrest Gump” is the personal story of the title character (Tom Hanks), but it works well on Independence Day because the narrative touches on a number of key events in American history. As director Robert Zemeckis tells of Forrest’s life, he offers interesting glimpses into milestones ranging from the Vietnam War to the Watergate scandal. “American Graffiti” (1973): George Lucas may be best known for creating the “Star Wars” franchise, but his finest movie is this nostalgic drama. The film is set in the 1960s, and it focuses on teens enjoying one last summer night before settling into their post-high school responsibilities. “American Graffiti” isn’t exactly patriotic, but it’s a beautiful reminder of what our country was like some 50 years ago. It also features an outstanding cast, including the then-young Richard Dreyfuss, Ron Howard, Cindy Williams, Mackenzie Phillips and Harrison Ford. “Born on the Fourth of July” (1989): Some war movies glamorize combat, but this film by director Oliver Stone is a reminder of the human cost of armed conflict. It also celebrates our nation’s dedication to free and open speech. The plot details the life of Ron Kovic, a real-life Vietnam War veteran who became a prominent anti-war activist after returning home paralyzed. Universal is releasing a new Blu-ray edition this week as part of the studio’s 100th Anniversary collection. Tom Cruise stars. “Top Gun” (1986): This film about Navy fighter pilots is action packed and a little bit silly. Still, its unabashed flag waving is tough to resist. Tom Cruise stars as rebellious pilot known as Maverick, and Kelly McGillis plays the superior officer he falls in love with. Directed by Tony Scott. great list. I love movies like Miracle (I just saw Warrior and loved that!). I know they are predictable but I almost always go for it. Apollo 13 is another favorite. In fact, its hard to think of anything you left off. Maybe Mr. Smith Goes to Washington? Rachel. It’s nice to hear from you as always. My working list was a little longer when I started writing, but I narrowed it to this group of films, which I like a lot. Indeed, I did think about “Mr. Smith Goes to Washington,” but I decided to limit myself to 10.